Recognised as one of South Africa's finest musicians, this popular band will headline an evening of entertainment at Borrowdale Park Racecourse presented by Sound Event Management (SEM) and sponsored by Heineken. The Parlotones have established a reputation for live and recorded musical excellence - and record album sales - with hits like Colourful, Giant Mistake and Push Me to the Floor. They will be supported by several top Harare bands in a concert starting at 6pm and ending at midnight, with The Parlotones on stage at about 9pm. Their concert will then form part of a musical weekend with A Summer Night Concert featuring South African singer Selim Kagee at the same venue the following night. The Rockin' Harare Concert is the follow-up to the annual Rock Down Harare concerts presented for the past 10 years by SEM and which, in addition to providing a yearly entertainment to the people of Harare, have been highly successful showcases for local musical talent in support of promoting local entertainers. 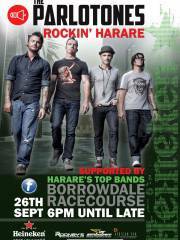 The concert will be held in the open air of the Borrowdale Park Racecourse, 24 hours after audiences' rock to the sounds of South African super group, The Parlotones.